A wedding scuttled, a suitor snubbed and a bride on the run are time-tested ingredients of a comic romp. Happy Bhag Jayegi has all this and more and yet is only mildly diverting when it isn't overly desultory. An Amritsar lass in love with a college mate of hers runs away from her engagement ceremony soon after the smarmy corporator she is due to marry does a full-on Sunny Deol dance of joy. She jumps into the wrong getaway truck and ends up in Pakistan. It sets off a chain of events that sees four Indians, including the girl's clueless dad, going round in circles in the city of Lahore. The son of a Pakistani politician, his befuddled fiancee, and a garrulous cop join the riotous rigmarole and make matters worse. Happy Bhag Jayegi falls short of being a side-splitting laugh riot because writer-director Mudassar Aziz does not make happy use of the narrative pieces available to him consistently enough to be able to deliver an outright winner. But Happy Bhag Jayegi, which delivers harmless fun for the most part in spite of the patchy screenplay, is marked by elements that set it apart from run-of-the-mill Bollywood rom-coms. For one, a Bollywood comedy in which most of the action unfolds in Lahore is a rarity indeed. That apart, the two women in the middle of the muddle - one Indian, the other Pakistani - hold their own as the men around them repeatedly get their knickers into a twist. The Indian girl is the Happy of the title - Harpreet Kaur (Diana Penty) - who, despite the mounting troubles, does not regret her misadventures one bit. She is always intent on living up to her name. The Pakistani lady is Zia Rahmani (Momal Sheikh), tough-nut daughter of a Lahore business tycoon. She gives no quarters to her would-be husband and expects none. The two men opposite them, on the other hand, are confused, if well-meaning, blokes. Bilal Ahmed (Abhay Deol) never tires of ruing his failure to follow his heart, blaming his father for yanking him away from cricket and pushing him into politics. Gurpreet 'Guddu' Singh (Ali Fazal), who is left guessing over his fate after Happy jumps out her bedroom window, is equally unsure of whether he has it in him to win the girl he loves. Guddu is supposed to be an aspiring musician but he is never seen making music. "Music mein magic hota hai," Bilal says at one point as he hatches a plan to reunite Happy with Guddu. The magic never materializes because the music on offer is pretty pedestrian. The villain of Happy Bhag Jayegi is Daman Singh Bagga (Jimmy Sheirgill), a small-time Amritsar politician with big-time ambitions. This guy is determined to marry Happy but is thwarted at every step. But he isn't a gun-toting, expletive-hurling bad guy. It is with dazed, deadpan resignation that he reacts to the grave provocations he is subjected to. The lover boy who gives the good-natured goon a run for his money is no obsessed Romeo either. Guddu allows Happy a long rope. All through film, the dialogue writer unsurprisingly pokes fun at Pakistan but the jibes are never overtly spiteful. There isn't much in Happy Bhag Jayegi by way of Pak-bashing that could unduly vex filmgoers across the border. Happy Bhag Jayegi whips up a steady rhythm in the first half only to lose its way a bit in the second. The film goes all over the place once Bagga decides to follow Happy to Lahore and enlists the support of a local gang of criminals. If Happy Bhag Jayegi does not get on one's nerves like such half-baked attempts at hilarity tend to do, it is because it remains completely inoffensive. It seeks to provide clean entertainment. The language is antiseptic, the women aren't objectified, and the men aren't lousy louts even when their actions aren't particularly edifying. These are small mercies that add up to a lot. Pakistanis might take umbrage to the way the Lahore cops are portrayed as a bumbling bunch. But, then, when doesn't Hindi cinema give policemen in general the short shrift? And then there is that grand revelation when man in uniform Usman Afridi (Piyush Mishra) refuses to travel to India because he does not want to consume 'India ka namak'. Bilal reminds him that Pakistan imports all its salt from India. "Namak toh hum India kaa hi khate hain," he concludes. 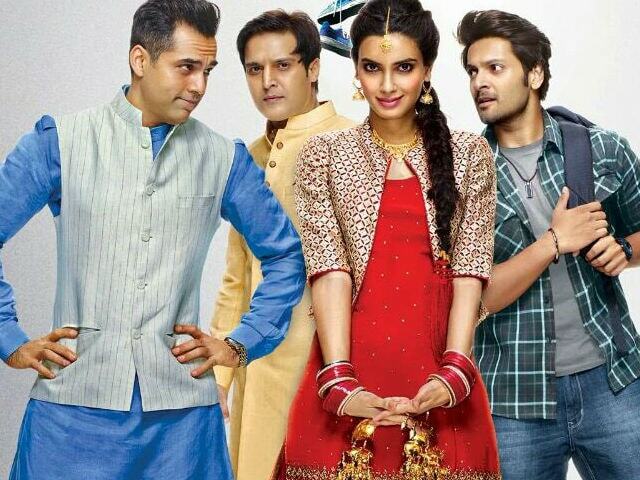 Abhay Deol, in his first release in two-and-a-half years, is the anchor around which Happy Bhag Jayegi pivots. He does not falter. Ali Fazal's role is rather sketchily written, but he is perfectly in tune with the unsteady state of the mind of the character he plays. Diana Penty, in only her second Bollywood outing, tries hard to pass off an earthy, sprightly Punjabi girl. Hers is an uneven performance. She doesn't exactly run away with the film. Momal Sheikh, in her first big screen release, is a welcome addition to the growing tribe of Pakistani actresses trying their luck in Mumbai films. While Jimmy Sheirgill is treated rather shabbily by the script, Piyush Mishra gets the best lines. The latter revels in the opportunity and provides the film's brighter moments.